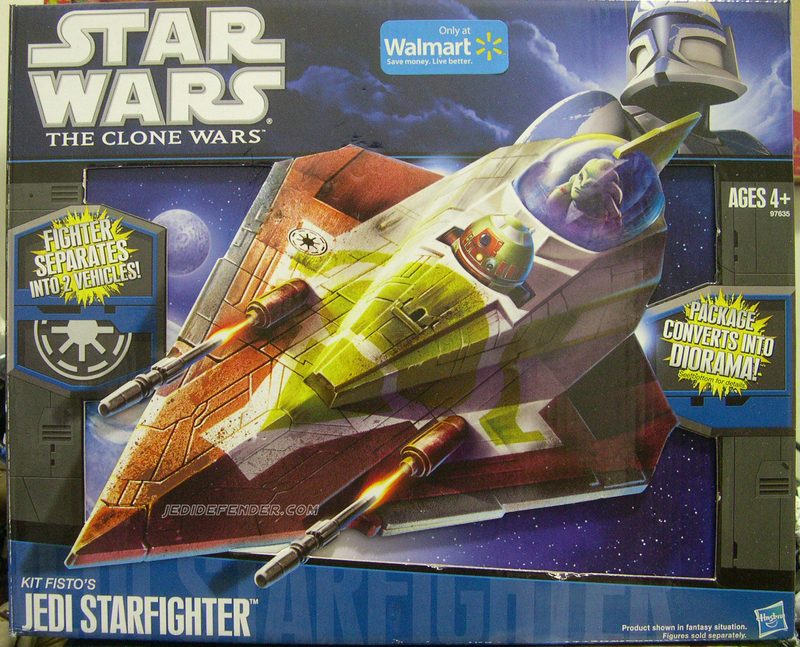 Confirming our previous rumor... JediDefender has acquired an image of the Kit Fisto's Jedi Starfighter which is designated as a Walmart Exclusive. Nothing amazing because it's another starfighter but if i see it i'll get it. Most likely a pass for me... wasn't there also a Target exclusive version of his ship (realistic style) that was orange/green? Also - Wal-Mart exclusive? Something tells me this is just not going to be that popular of an item and we'll see them in clearance and "anything goes" aisles a lot. I could be wrong though of course. Yep, in the TSC line. Edit: No sorry you are correct, when i quickly looked at mine then it looked cream on the box soz. So will Fisto even fit in his fighter this time??? stroebel83 wrote: So will Fisto even fit in his fighter this time??? I'm sure with the oversized cockpit of the CW's Starfighter that even the big headed first CW's realistic swimming figure of Fisto would fit. when we should we start looking for this? I saw it today at my local sci fi shop, so i should think it shall be appearing in US stores soon. Paulskywalker wrote: I saw it today at my local sci fi shop, so i should think it shall be appearing in US stores soon. The good thing about this is that it's based on "The Lair of Grievous."